A Turlock restaurant memorializes a 1988 campaign visit by President George H.W. Bush and Mrs. Barbara Bush. Jim Stevens was owner at the time and serving the President was his crowning achievement. "There was some gentleman all dressed up that came in and said, 'You are going to have a visitor in about a half hour,'" Stevens said. Oct. 15, 1988, then Vice President George H.W. 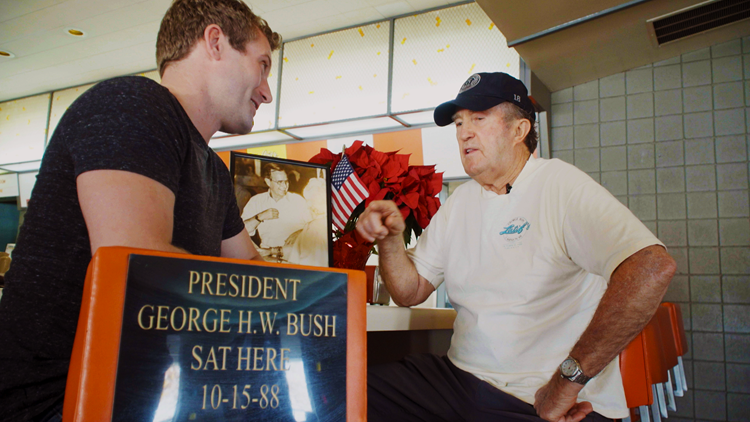 Bush walked into Latif's, hot off the campaign trail, and sat down on a corner stool in the center of the Restaurant. "I told them, 'I have a banquet room upstairs.' But they said, 'No, we want them right here at the horse shoe counter'." recalled Stevens. For the next 45 minutes, George and Barbara Bush ate lunch and mingled with customers. At the time, a celebrity entourage followed him around. "The Beach Boys and Chuck Norris," Stevens said. Everyone in town got word of Bush's visit. Those who were inside the restaurant got to stay. Those who weren't inside watched the future President eat his lunch from outside the restaurant window. "We ended up making shirts with his order printed on it," Stevens said. "He had a bowl of chili, a chocolate shake, and apple pie." When it was all over, and Bush won the presidency, customers came from far away to sit in his chairs. "It was a time that was burnt [sic] in my memory. I can remember it like it was yesterday," Stevens said. A photo of President George H.W. Bush's campaign visit, near the seat where he and Mrs. Barbara Bush sat during a 1988 campaign visit to Latif's Restaurant in Turlock. 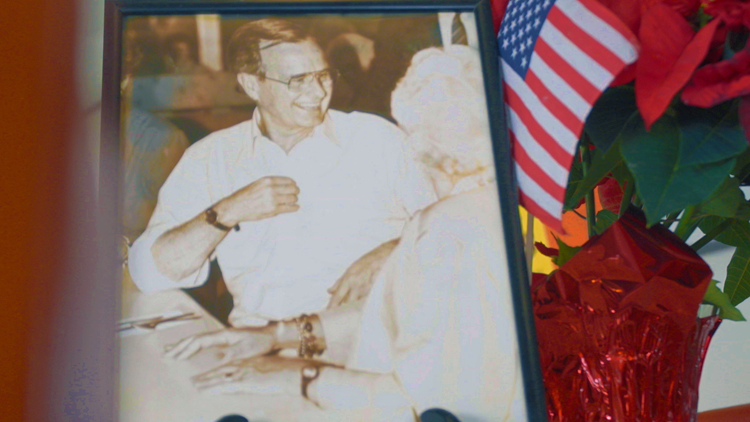 Today, his picture and a flower occupy his table, but President Bush and his seat will be forever memorialized. "Well, it was special for the whole community, especially because he was a respected man and it was an honor to have him in Turlock," Stevens said. Not many people can say they've cooked for the President of the United States, but Jim Stevens can. So next time you come to Latif's, pull up a seat and ask him about it. Jim Stevens, former owner of Latif's Restaurant in Turlock, tells ABC10's John Bartell about President George H.W. Bush's 1988 visit.